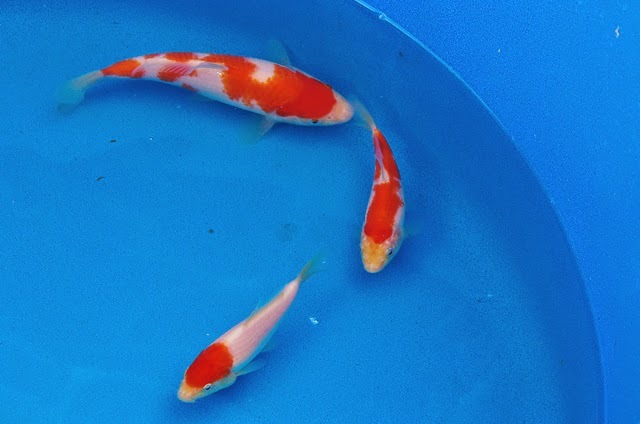 Home / Kohaku / development comments on a few more of the keepers. development comments on a few more of the keepers. And, here are some examples from the rest of the keepers with my thoughts on what I've hung on to them, and what I see as the development risks. 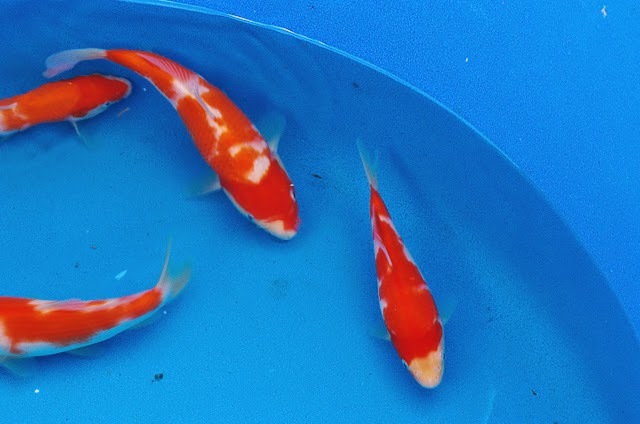 Top kohaku - looking good on the first 2/3rds still, but obviouisly big trouble pattern wise on the rear third. There is a small dot of red on the rear end on the far side that you cant see in the photo - but it's unlikely to compensate sufficiently. Thought I'd profiled it in the blog previously, but cant find the pic. It would be interesting to track the small dot of red.... Hanging onto this one for development interest. 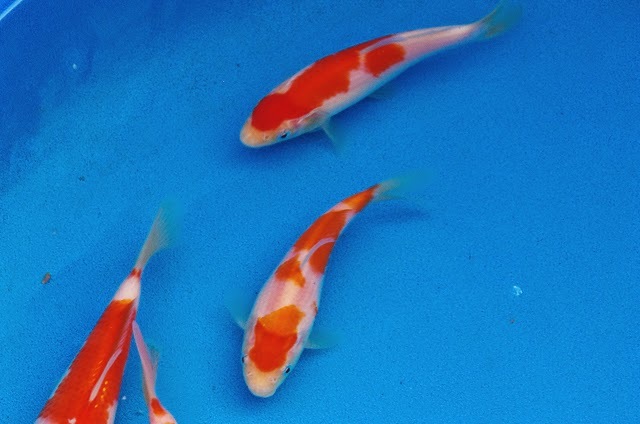 Bottom kohaku - Could really do with the white area between the first and second hi plates closing up a bit.. See pic below of the same kohaku a month earlier. Note the shine line along the dorsal ridge is still present. An indicator of good skin quality. I am interested to see how the patterns develop on these two. Particularly that larger one; the white cuts into the red forming jigsaw like pieces - but will they break and shift into something great, or will the breaks on the shoulder area just end up messy. 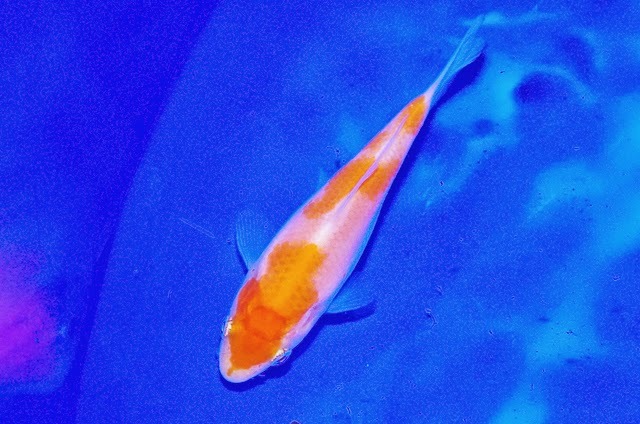 This is one of the smaller ones that I nurtured in the vortex tank - moved to the main keeper tank and is now in the middle order size wise. 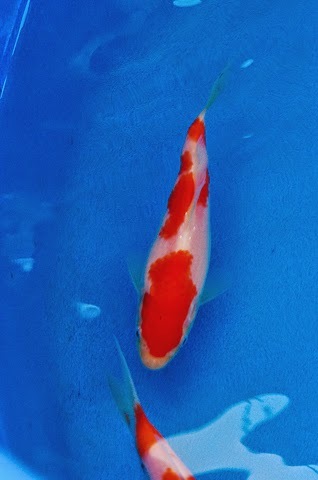 The white is still looking good compared to it's peers, and the red stood out as having more refined edges (sashi and kiwa) than many of it's peers. Notice how the trace of red running to the nose back in August (see pic below) has disappeared. Thank goodness for that! Starting with the koi at the top - I'm liking the body on that one, and the pattern could turn out well too; but question marks over the quality of the hi. I dont know how significant the weaknesses in the sashi and kiwa are at this stage. 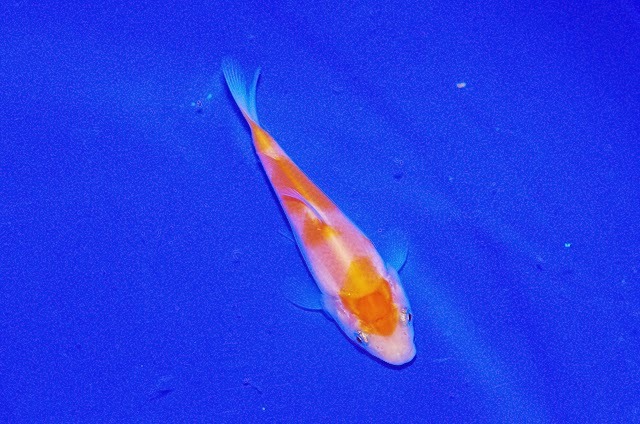 Middle koi - ok, it's too bald on the head. 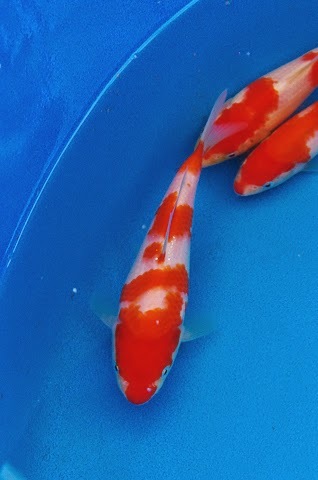 But, do I know for sure that in a few month's time this koi will turn out to be a discard;... no. So, I've kept it for the development interest. Bottom koi - really should have put this with the fish to move on. but, I only have a few tancho and even through the red drifts too far onto the body oin this one - my thinking is to hang onto it and see how the tancho mark develops on the head. So - keeping this one for development interest.